Friday, 15 March 2019, 2:09p.m. Winston: "If you think I'm lying - that's too bad"
The nation is in mourning after the deadly massacre at two Christchurch mosques — a day of infamy which Prime Minister Jacinda Ardern described as a "terrorist act" and "one of New Zealand's darkest days". At least 49 people were killed, and a further 48 injured, after gunmen opened fire at the Masjid Al Noor and Linwood Masjid, with a livestream of the horrific massacre being broadcast on the internet via a camera on one of the gunmen's helmets. "The loss of life and the number of those who have been injured is tragic," said Police Commissioner Mike Bush as he confirmed a 28-year-old man would appear in court today charged with murder. "As the Prime Minister has stated, this has been designated a terrorist attack. This has been an abhorrent event and my thoughts are with all of those affected in Christchurch". 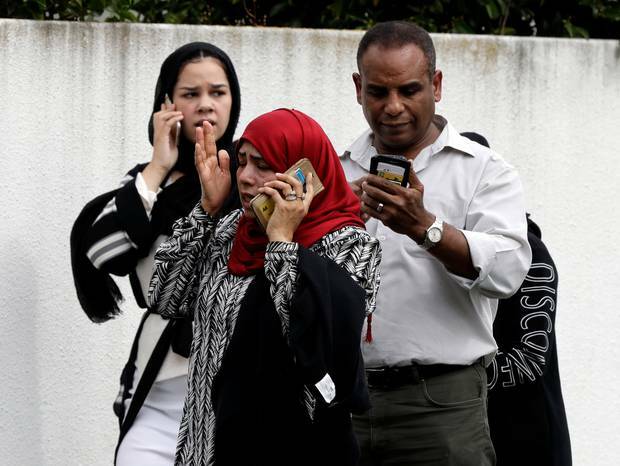 He said 41 people had been killed at the Masjid Al Noor and a further 7 at the Linwood mosque and he urged people not to travel to mosques "anywhere in New Zealand". The main shooter was identified by Australian police as Brenton Tarrant — a white, 28-year-old Australian-born man, who uploaded to his Twitter account before the shooting a manifesto explaining his intentions. Bush said three other people had been taken into custody — including one woman. One of those people was found armed at the scene but didn't appear to have had anything to do with the killings. Police are still "working to understand" what involvement the other two, who were also armed, had in the shootings. Bush said officers had disarmed two improvised explosive devices found in a vehicle used by those believed to be behind the atrocity which has sent shockwaves through New Zealand and the Muslim community around the world. Last night anxious family and friends of many of those injured were pacing outside the hospital, waiting for news. There was wailing and crying as some learned their loved ones will not be coming home. "We just got some very bad news," said Mahdi Zougub, as his friends hugged nearby. "We think our friend ... we think he's gone. There's a lot of emotion." Ramazan Ali, from Christchurch, said he believed he was the last person to make it out of the Deans Ave mosque alive. "Allah was looking out for me," he said. Ali had been attending regular Friday prayers, and said the shooting began just as the sermon ended, while around 300 people were in the building. Most people tried to rush out of two doors. He jumped under a bench and waited for the firing to stop. But after the gunman continued reloading, he decided to make a dash for it and dived through a broken window. As he did so, a man was shot in the chest right in front of him. Ali said his brother Ashraf was in the mosque and was still missing. His cousin's husband and a friend were also badly injured. The magnitude of the tragedy was evident when an emotional Ardern fronted a press conference, saying it was "one of New Zealand's darkest days". "There is no place in New Zealand for such acts of extreme and unprecedented violence which, it is clear, this act was," she said. "My thoughts and, I'm sure, the thoughts of all New Zealanders, are with those who have been affected and also with their families." 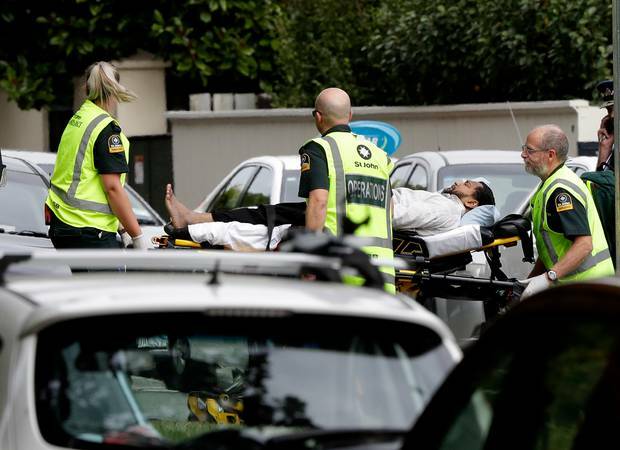 She said the shooting was "an extraordinary and unprecedented act of violence", saying some of the many of those who had been "directly affected" by the shooting would be migrants to New Zealand. "They have chosen to make New Zealand their home, and it is their home," Ardern said. "They are us. The person who has perpetuated this violence against us is not. They have no place in New Zealand." "This can only be described as a terrorist act," she said. The terror felt following the shootings had a ripple effect throughout the country. People were on edge and police were visible on the streets in many cities, including Auckland where two suitcases left near Britomart Train Station were blown up by the Defence Force. In Dunedin last night a section of Somerville St was closed as police searched a property thought to be linked to at least one of the attackers. Members of the armed offenders squad could be seen coming in and out of one property in the street and residents nearby were told to leave. Police remained tight-lipped about their interest in the property but a vehicle used in the shooting is believed to have been bought in Dunedin and is registered to a Somerville St property. Messages of support have begun pouring in from around New Zealand and the world. Victim Support set up a Givealittle page and it had passed $200,000 last night. As Bush and Ardern addressed the nation, horror stories emerged from the moments gunfire broke out at the mosques — and of stories of heroism from police officers and members of the community who went to the aid of the injured and dying. South Island manager for Naki Labour Hire, Carl Pomare, and one of his workers was among those who went to the aid of those shot at the Linwood Masjid. They were alerted to the sight of people "running like their lives depended on it" and then heard gunfire. "We saw them being shot. Being mowed down as they were running away," Pomare said. "I said to my mate, 'We need to do something'." Among those they helped was a 5-year-old girl who had been critically injured. Her father, who had also been shot, was nursing her. "We [were] just thinking, 'Come on ambulance, come on'." They eventually drove her to Christchurch Hospital. "My worker was nursing a guy who had been shot in the back three times for about half an hour, saying 'Hang in there buddy'. He passed away in his arms." Among those unaccounted for was 39-year-old Rahimi Ahmad, who went to Friday prayer at the mosque with his 11-year-old but never came out. Zinzan Hawke and his flatmates applied emergency first aid to a Muslim man who fled to their house, which is near the Masjid Al Noor, after being shot in the leg. "We called an ambulance and police and I applied pressure to the wound," he said. "It's just human nature to help someone in that situation." Hawke had been awoken by the gunfire and was left shellshocked by what the injured man told him. "I thought he was making it up ... I didn't realise something of this magnitude could happen in New Zealand. I was just in utter panic." It also emerged last night that a prominent member of the Muslim community fought back against the gunman, firing two shots at them as they sped away. He was heard telling police officers he was firing in "self defence". Christchurch man Nathan Cambus also spoke of the arrest of one of the wanted men. He was travelling on Brougham St when he saw a grey station wagon "boosting it" away from police. Armed police "hit the car into the kerb" and then jumped out "so fast", guns drawn, he said. "They pulled three guns, maybe four, from the car and then they pulled the man out right over the handbrake ... it was pretty scary." There were several hundred people gathered for Friday prayers at the Masjid Al Noor when gunfire broke out. Among those making their way to the mosque was the Bangladesh national cricket team; in the city for the third test against the Black Caps which was set to start today. The side managed to escape unscathed, with star player Tamim Iqbal Khan posting on Twitter: "Entire team got saved from active shooters!!! Frightening experience and please keep us in your prayers". 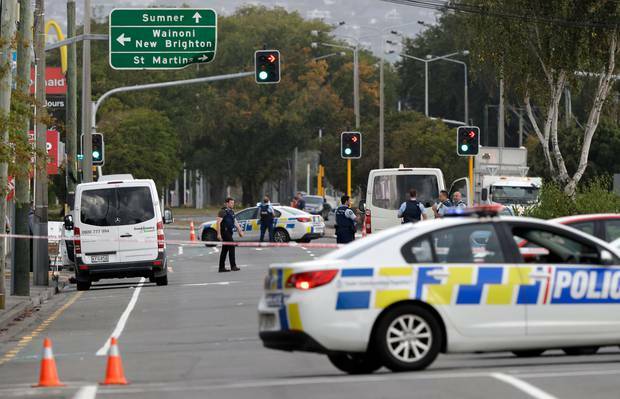 New Zealand Cricket boss David White confirmed several hours after the attack that the test had been cancelled, saying it was "inappropriate to play cricket at this time" and sending his "heartfelt condolences to those affected". As the nation mourned the dead last night, security analyst Paul Buchanan — director of the 36th Parallel Assessments — said the attacks were a were a "turning point in our politics, and for society in general". He said New Zealand had been "infected with the virus of homicidal politics", which had been previously seen "all too often in the United States and Europe". "And it has now come home," he said. "This is big trouble. This is a watershed moment for us." • 1.40pm: A gunman opens fire in Al Noor Mosque in Deans Ave, near Hagley Park in Christchurch. The gunman leaves the mosque and fires random shots as cars drive past. He returns to his Subaru station wagon parked in a nearby driveway to get more ammunition and then re-enters the mosque. 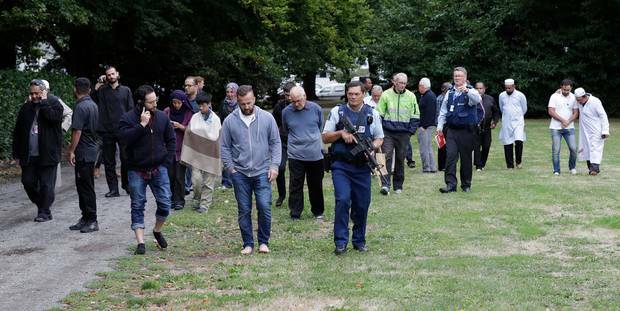 A shooter opens fire at Linwood Mosque in Linwood Ave.
• 2pm: The Bangladesh cricket team, in Christchurch for the third test against the Black Caps, rushes away from Hagley Park. Christchurch schools are put into lockdown with text messages and Facebook updates sent to parents. Police clear Cathedral Square, telling students who had gathered for climate change protests to go home immediately. • 2.36pm: Police Commissioner Mike Bush urges everyone in the central city to stay off the streets. • 2.45pm: University of Canterbury and council buildings including the Art Gallery and Central Library are in lockdown. • 3pm: Christchurch Hospital announces the public should stay away unless for an emergency. No staff or patients are to enter or leave. • 3.15pm: Two car bombs in a vehicle on Strickland St are deactivated by the Defence Force. • 3.20pm: A man is pulled out of a car and arrested on nearby Brougham St.
• 4pm: Police announce one person is in custody. Bush says the situation is still evolving and asks all mosques around the country to shut their doors, advising people to stay away from Friday prayers. Westfield Riccarton and Northlands Malls are in lockdown. • 4.10pm: In New Plymouth PM Jacinda Ardern describes this as "one of New Zealand's darkest days". • 4.25pm: A man is apprehended on Harrow St in Phillipstown. • 5pm: Police search a home on Somerville St in Dunedin. • 5.30pm: Bush says four people — three men and one woman — have been taken into custody. • 5.47pm: Lockdown of schools in Christchurch is lifted. • 7.25pm: Ardern announces at least 40 people have died in the mosque shootings. • 7.40pm: David Meates, chief executive of Canterbury District Health Board, says 48 people, including children, are being treated for gunshot wounds at Christchurch Hospital and other health clinics. • 9pm: Bush says 49 people are dead — 41 died at the Al Noor Mosque, seven at the Linwood Mosque and one in hospital. A 28-year-old man has been charged with murder and will appear in the Christchurch District Court today. Two others are in custody. The fourth person was not connected to the attack. • 10.45pm: Police confirm the Somerville St property is being searched in relation to the Christchurch incident. Members of the public living on surrounding streets have been evacuated as a precaution.